A wakeup call for tired eyes. Corrector is pink- or peach-based to neutralize under-eye darkness and is designed to be used before Creamy Concealer. New and improved formula is long-wearing and brightens dark circles with quick, just-right coverage that's easy to blend and won't crease. And since great makeup starts with healthy skin, Corrector is infused with skin conditioners to protect the delicate under-eye area. I have always had a huge issue with dark circles - a combination of long hours on the computer and allergies - plus blame it on genetics because this is apparently a common problem among Indians. Even if I do pile on concealers, the pigmentation never truly disappears, and my undereye area just looks horrible with all that makeup. And then, like they say in the ads, I discovered this little miracle in a pot - Bobbi Brown Corrector! I read about correctors for the first time in one of the Bobby Brown makeup books, and the idea appealed to me instantly. Correctors are packed with pigment but in a light-weight formula, and they are meant to neutralize any discoloration and help give a more even appearance to the skin tone. This can then be followed by a regular concealer if required. Available in 12 shades, these are either peach based (to neutralize green undertones) or pink based (to sort out the blue discolorations), the one important thing with these is to get the right tone for your discoloration rather than your skin. Since my undereye area has greenish brown pigmentation, I opted for the peach-toned corrector in Dark Peach. This also matches my skin undertones, and I can get away with using this alone without a concealer over this. Scroll on for photos, swatches, and more. The product comes packaged in quite a small pot - almost similar in size to some of the MAC single eyeshadows. The little compact features a miorror on one side and what looks like a really small amount of corrector on the other. As I mentioned earlier, I picked a corrector with a lot of peach to it and in a darker color since I felt that would work best for the pigmentation that I have. This is one product I actually tried a dozen times at Sephora to be absolutely sure that I get the right shade, and I think it's absolutely essential to get this right for this product to work effectively. On to the product itself, the consistency is thick - almost solid in texture - and I find it much easier to pick up the product with my fingers than with a brush (with the warmth from the fingers melting the product some). The texture is a little dry going on the skin, and moisturizing beforehand helps the product go on the skin better. Correctors are very, very pigmented, and a small amount goes a long way, and I rarely need to build up too much to get coverage. 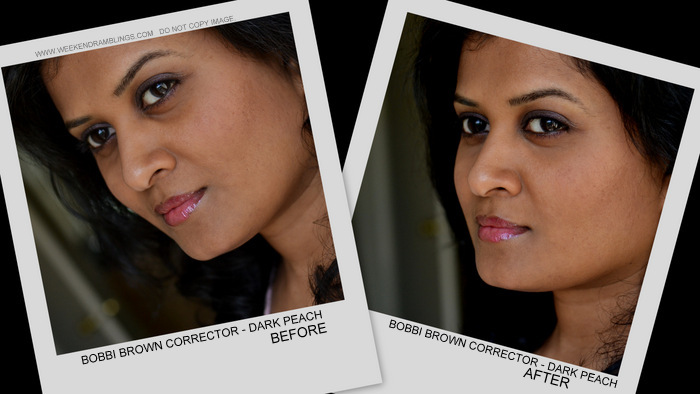 Bobbi Brown Corrector in Dark Peach looks quite pigmented in the pan and on swatches too. This is, however, not really a proper concealer as such and is meant to neutralize pigmentation and even the skin tone, so the deep pigmentation works wonderfully for this. Here's a look at swatches on my hand. I have used smaller amount for the blended swatch, not moisturized my hand either, so you can see the slightly dry-ish texture of this product. I use my fingers and a brush (to get into the corners) to pat the product on to the skin. Make sure skin is well moisturized/hydrated before applying the corrector to ensure it holds on to the skin better. Blend into skin in small patting motions rather than dragging the product across the skin. This is a corrector, not a full-coverage concealer, so for someone like me, if I want to camouflage my dark circles completely, I would need another concealer over this, but I think a corrector is quite sufficient on it's own for lighter coverage. Set with powder to help the product stay on longer. Use a generous amount of a creamy, hydrating moisturizer - a bit more quantity than what you would use regularly. This helps the corrector spread and blend into the skin quite easily. Use my finger to pick up the product - helps warm and soften the product some - and pat it on to the skin. Use a brush to get the product into the hard to reach corners of the eye. Rather than blending the product into the skin, use patting motions to sort of press the product on to the skin. I find this gives me a better, even coverage. Set with powder to keep the product in place. As for results, this is simply the BEST product I have tried for my undereye pigmentation. Correctors are meant to be used under a concealer, but I use this on its own (mostly because I am still on a quest for my ideal concealer). I find this quite sufficient to brighten my undereye area, neutralize the discoloration, and used with a tiny brush, this even does an awesome job at masking some of the spots on my face (though, it is a slightly darker shade for most spots). I cannot ever explain just how amazing this product is - just one touch and it instantly neutralizes the darkness, and it's so so light nobody would ever know there's any makeup on! No creases, and this lasts the whole day. This is truly a miracle in a pot, at least for me. If you already have a concealer you love, this probably might not make you a believer, but if you have been struggling with undereye pigmentation and/or on the lookout for a lighter (not sheerer) makeup, then do give this a try. I use this. It's the best I've ever used! Rads which eye cream do you use under this. I use Bobbi Brown extra eye repair but I can use it only at nighttime because it's really heavy. I am still searching for some good daytime under eye cream. Any suggestions? I do not have a separate eye cream...:embarrassed: I just use the Lush Dream Cream all over my face..or just around the eye area if I am using another moisturizer for the rest of my face :| Currently, I have a few samples of Chanel Sublimage, so using that - is good but terrrrrrrrrrrrrrrrrrrrrrrrrrrrrrrribly expensive, so I doubt if I would ever get it after I run out of samples. I have never really found a decent eye cream, though..I just want something that moisturizes without causing those tiny bumps or looking too oily..and I definitely don't like those caffeine-containing gels..I don't get the point of just putting stuff on that doesn't do anything useful in long run.. I'm so glad you reviewed this. I truly need a corrector for my hyperpigmentation undereyes and decided on the BB Dark Peach over Eve Pearl. Just waiting for the Sephora VIB sale next week to pick this up. Do you have a recommended concealer you would use over this?